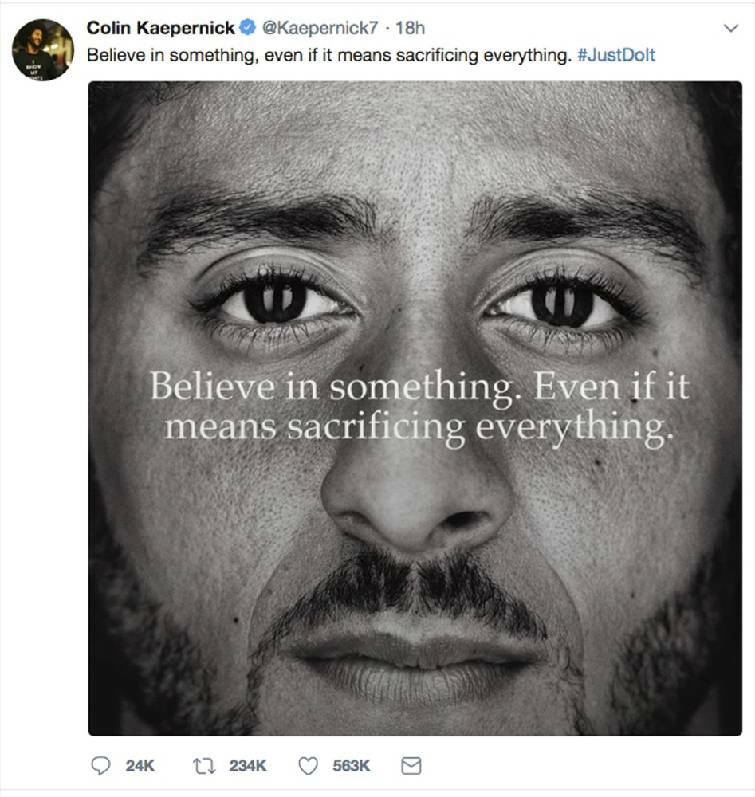 NASHVILLE — Controversy over a Nike ad featuring Colin Kaepernick, the former San Francisco 49ers quarterback and first athlete to kneel during the national anthem over police shootings involving blacks, is headed to the General Assembly. And quite possibly the University of Tennessee at Knoxville. In a Friday tweet, Senate Finance Committee Chairman Bo Watson, R-Hixson, said he has asked the Office of Legislative Budget Analysis to "review what TN state-financed colleges & universities have Nike contracts and report findings." Watson said in a Times Free Press interview Saturday that he asked for the review as a result of constituents who are upset about the Nike ad unveiled last week and now asking him whether any public higher education schools in Tennessee have Nike contracts. While the senator didn't name any campus, UT-Knoxville began an eight-year Nike contract in 2015 that's worth a total of $34.9 million in cash, equipment and other services, the Times Free Press and other news organizations reported at the time. Efforts to reach UTK athletic department spokesman Tom Satkowiak by email about the contract were unsuccessful Saturday afternoon. Another official noted his hands were likely full with the Tennessee Vols playing East Tennessee State University. The University of Tennessee at Chattanooga has a contract with Adidas, according to previous Times Free Press news accounts. In his tweet, Watson linked to another tweet, this from conservative Fox News talk show host and commentator Sean Hannity, who cites the College of the Ozarks, a private Christian college in Point Lookout, Mo., which last week announced it would no longer use Nike products. "IT BEGINS," Hannity's tweet states. "College Removes NIKE LOGO from All Athletic Gear Over Kaepernick Ad." A number of critics have taken to social media with photos or video of them setting fire to or defacing Nike products. Meanwhile, MarketWatch and other news outlets reported Saturday that Nike online sales jumped 31 percent after release of the Kaepernick ad. Watson said neither he nor others are denying Kaepernick's constitutional right to speak nor Nike's right "to endorse that behavior." "But I think when people make expressions, when state dollars are involved at state institutions, I think we should at least review those and be pretty sure that the companies best represent Tennessee," he said. The first order, Watson said, is determining whether any public institutions have Nike contracts for uniforms and the like. "Is that a contract in the best interest of the state of Tennessee and the taxpayers?" Watson asked. "That's a discussion for another day until we know exactly what the data is. I'm probably not alone as a legislator for having people asking what state universities in Tennessee have contracts with Nike." The senator also noted "Nike has made political statements which of course there is a fair debate about it. Nike has decided to make a political statement and I'm not sure if the university, a land grant university, is in business or should be in business to make political statements." The Republican-controlled legislature has often weighed in on a variety of social issues involving UTK. The full two-minute Nike spot highlights several "superstar" athletes, among them LeBron James and Serena Williams, while also touching on the controversy of NFL players protesting racial inequality, police brutality and other issues by demonstrating during the national anthem. Kaepernick narrates the ad. He only appears on screen midway through it. "Believe in something," says Kaepernick, who has not been signed by any NFL team after leaving the 49ers. "Even if it means sacrificing everything." Chattanooga Democrat Randy Price, who faces Watson in the Nov. 6 Senate District 11 contest, said he found it "kind of interesting that instead of what the whole discussion should be about and what Mr. Kaepernick started" by trying bring more attention to fatal police shootings, Watson is focusing on contracts. The ad sends a message on "if you believe in something strongly enough to risk giving up everything," Price said, adding he thinks about people like U.S. Rep. John Lewis, D-Ga., who as a young civil rights activist battling segregation "put his life on the line." "Going after Nike is a diversionary tactic and doesn't do anything to address the initial problem that peeople are trying to get solved," Price said. Speaking earlier, Watson said people locally, "particularly in my district, take great pride in the American flag. They take great pride in the Pledge to Allegiance; they take great pride in the national anthem. "Many of them believe, I would say the majority of them, believe that paying proper respect to those symbols of our national pride and history are important," he added. "And while you certainly have a right to be disrespectful, they have a right to push back." He said that once lawmakers see if there are any Nike contracts "the public through their elected representatives may say that's not a good idea." Noting any state-funded school that entered into a Nike contract "could not have anticipated that Nike would have chosen Colin Kapernick as the face of their organization," the senator said, "I suspect some of those contracts might not have [been] entered into had the university known that Nike was going to engage in political statements."